File groups allow you to manage content on your devices, they can be assigned to multiple profiles allowing re-use of the same content. In order to use file groups you must have Kiosk Browser v2.5.5 installed on your devices, otherwise files will fail to download. 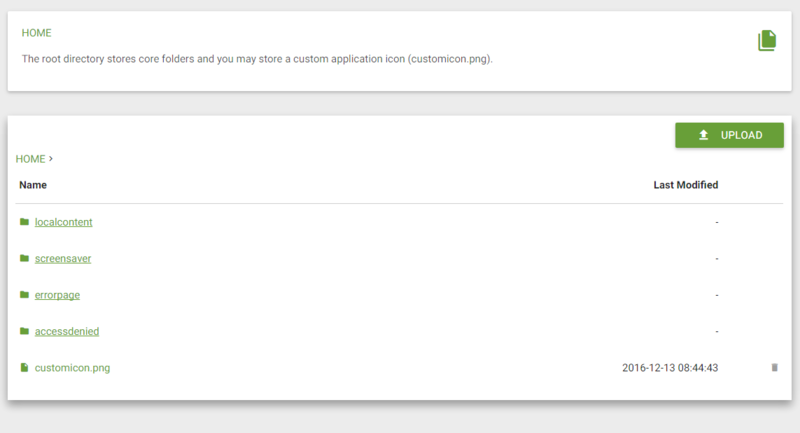 The root directory stores core folders and you may store a custom application icon (customicon.png). Upload image files (jpg or png) for an image screensaver or a single kioskvideo.mkv/kioskview.mp4 for a video screensaver. Upload your own error page: index.htm and associated images, css, js etc.... Displays when a webpage fails to load. Upload your own access denied page: index.htm and associated images, css, js etc.... Used in conjunction with the whitelist/blacklist. To assign a file group, click the EDIT button against the profile you wish to link the file group to. Select your chosen file group from the drop-down list and click save. Once assigned the devices using this profile will automatically download the files within the file group, deleting any existing content stored in the folders detailed above. By default when a device downloads a profile it will also download files from the associated file group. 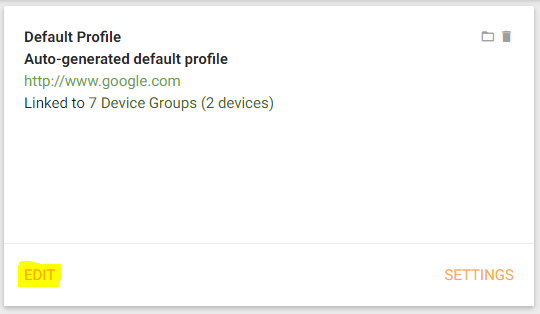 Only if the profile is changed will the device check again for changes to the file group. When making changes to a file group (uploading/deleting files/folders). The file group is not automatically downloaded on devices unless you deploy the changes. When clicking "deploy changes", all profiles and their devices linked to the file group will automatically download the changes (within 1-5 minutes).